Aquarium shops sell an impressive array of fish tanks in glass and acrylic and in every conceivable shape and size: rectangular, hexagonal, cylindrical, tall, short, and every size in between. Tanks have been built into cabinets with facings in everything from faux stone to cherry wood to marble. They have also been built into glass coffee tables. While many of these tanks are impressive, they can be very expensive and certainly intimidating to a beginner. 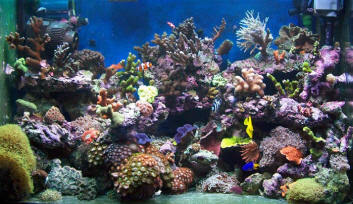 Still, you want a tank that will look good, accommodate a good selection of fish and plants, and be easy to care for. Tanks now come in two basic types: glass or acrylic. Glass tanks are usually cheaper but they are heavy and can crack and break more easily than acrylic tanks. Acrylic tanks scratch easily and can look pretty beat up if you’re not careful with your tank cleanings. Still, you don’t have to worry about cracks and breakage. Often aquarium shops offer beginner’s deals that include the tank, filters, lights, heater, and gravel. These can be good deals but very often you will find that once you’ve got your tank going you may want some different accessories. It’s also worth checking out the price if you get the accessories individually. It may be a little more expensive but you may get better products. While many first time aquarists think that beginning small is the best idea, this usually turns out to be a bad choice. The amount of work involved in setting up a 5-gallon or 10-gallon tank is exactly the same as the work in setting up a 20-gallon tank. The same goes for cleaning the tank. You will most likely find that you want more fish than you started with and now you have no room to grow. It’s better to begin with a 20-gallon tank. For rectangular tanks these come in what are called 20-gallon high or 20-gallon long tanks. The high tanks have the same length and width of a 10-gallon tank, but are higher. The longs are the same height as a 10-gallon but longer. The choice usually depends upon the space you have set aside for the tank. Either of these tanks will give you enough room for a good fish community that can include some groups of schooling fish such as barbs or rasboras along with your other good community tank species like gouramis. Your tank will have movement and color. Other shapes besides the classic rectangle can be fun to look at but be certain before you buy one that the filter equipment you choose will fit inside and the lighting you choose will fit above. What determines the number of fish your tank can hold is not so much the amount of water in the tank, as the amount of surface area available for oxygen exchange. High narrow tanks may look appealing or fit your decor, but they will hold far fewer fish. If you outgrow your tank, don’t throw it out. Save it for a quarantine tank for new or sick fish or use it for a breeding tank.